Tonight’s the night! The Leeming Spartan Cricket Club proudly celebrates its one-hundredth anniversary tonight at the Esplanade Hotel in Fremantle! An amazing turnout, 18 months of planning and 100 years of history all come to the fore tonight as we celebrate the biggest event in Spartan history! Some of the biggest presentations will be taking place, from a Q&A on our history lead by our mystery presenter, to who will make our Team of the Century. For the latter, here’s a clue – there’ll be twelve inducted, and you can find out tonight! Also don’t forget – those wishing to take the safest option are encouraged to head to the Club at 5:00pm to take our hired bus – just $10.00 a head and returns you back at midnight! This year the Leeming Spartan Cricket Club celebrates its unprecedented one hundredth anniversary, and to celebrate, we have planned the biggest event in our incredible history! 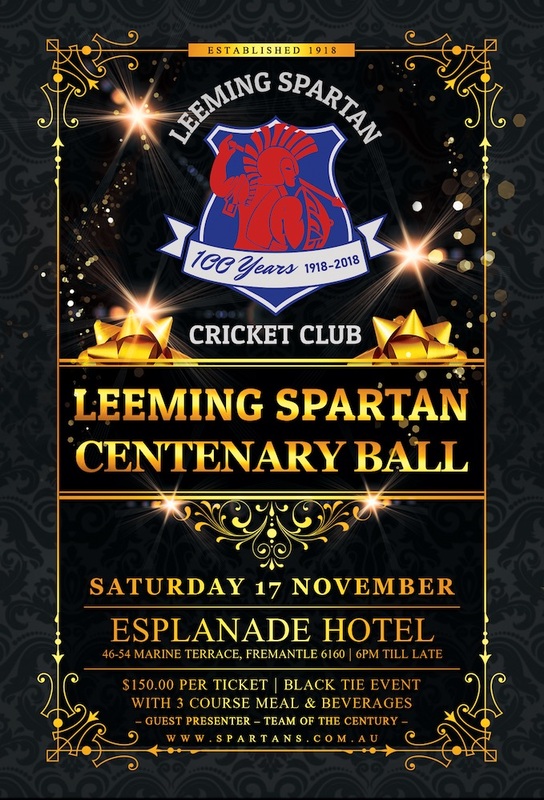 The Leeming Spartan Centenary Ball is taking place at the Esplanade Hotel in Fremantle on Saturday the 17th of November and will feature a number of once in a lifetime moments, including the unveiling of our Team of the Century. The Leeming Spartan Cricket Club was founded in Fremantle in 1918, and appropriately, we have decided to head back to our homeland to commemorate this record breaking centenary year. You will of course be treated to some of the biggest presentations in Spartan history, including our Centenary Auction (with ten fantastic items including a trip to Mount Everest!). One of the early stats to come from the night is that of our 53 living life members, an incredible 39 will be present tonight – 74%! We cannot wait to see everyone tonight!